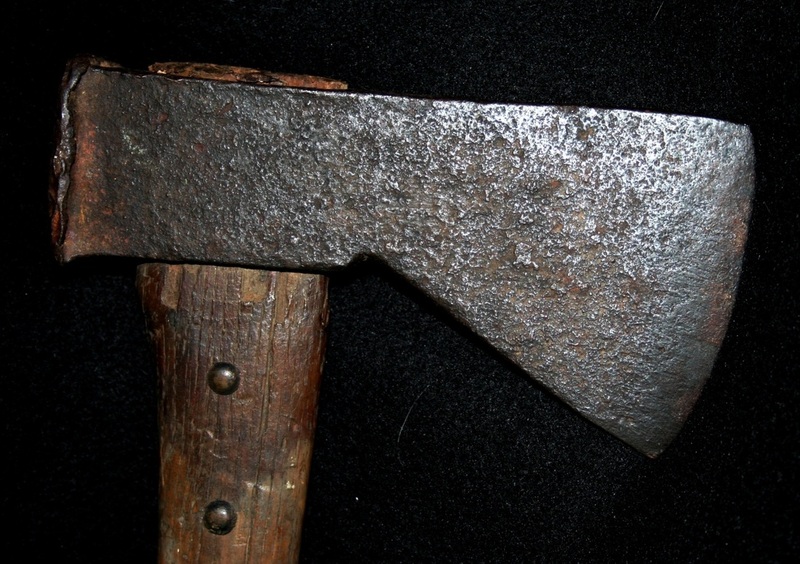 These flat polled trade axes were the classic design for the Hudson's Bay Company. 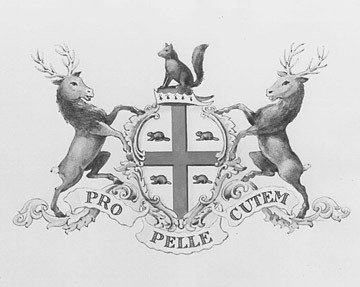 While they still traded the round eyed 'polless' ones, these were always associated with HBC during the fur trade days. 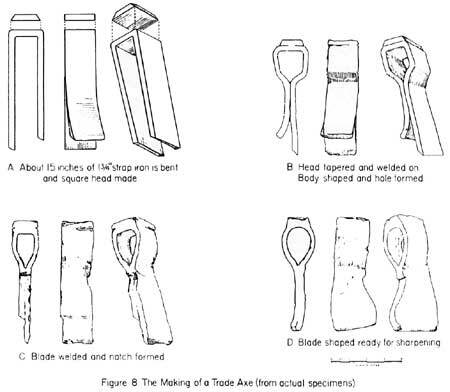 They would have all been hand forged during the fur trade period. Notice the poll is only slightly thickened and the top profile is flat on top --90 degrees to the handle with the bottom of the blade angle being around 48 degrees from the top. Typically they have an arced edge rather than flat across. NONE ARE EVER MARKED HBC OR HUDSON'S BAY COMPANY-only the fakes are. 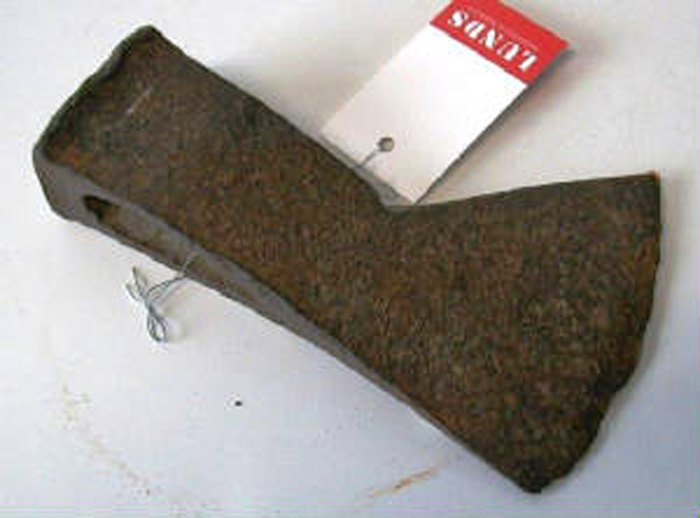 Below here is a beautiful old Hudson's Bay Axe that was hand forged with an original or period looking haft. A careful look at the 3rd & 4th photograph will show that the brass tacks (which appear to be authentic & from the period) were added later. Tacks that have been there a long time during it's use will have a collection of dust and dirt in a ring around the tacks. 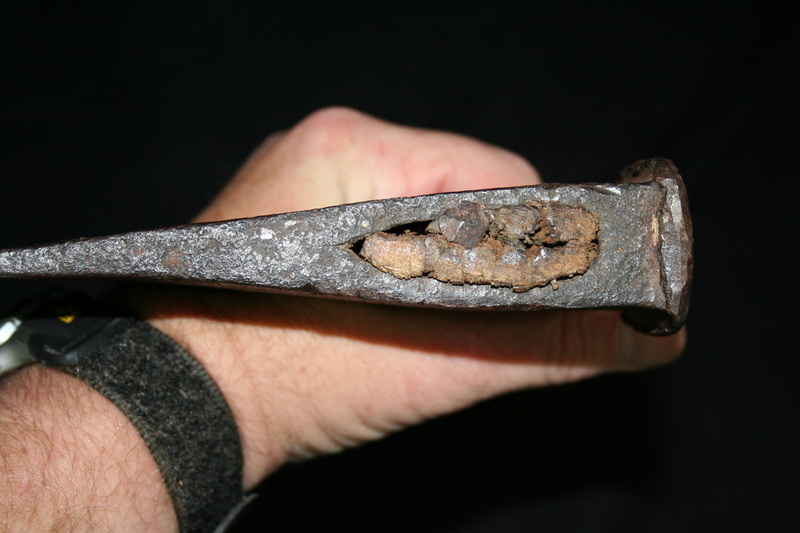 There is no way it cannot have that patina unless it was carefully cleaned with a toothbrush. Even wiping it down with rags will still leave those tiny little dirty rings around them. Much as I'd like to, I can't argue with physics. When a movable object meets an immovable objects it stops. With the absence of that patina around them (or under them), these tacks were added recently to give it a more Indian look. 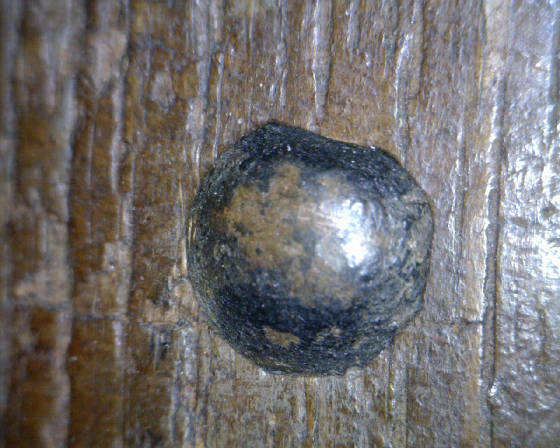 Also the tacks have remnants of black paint on it indicating it came from another unrelated item such as a hide trunk or furniture. Trade tacks were never painted black because Indians desired them for their shiny appearance. This is an all too common occurrence. Genuinely antique brass tacks are removed from deer hide trunks & other worn out items of little value & then added to other relics to increase the profit that by 'Indianizing' it. 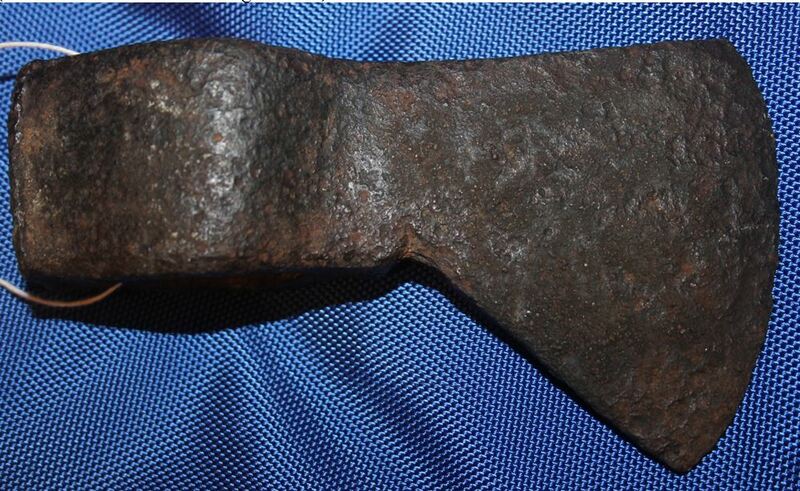 Still, the hatchet & haft are genuine and likely did see Indian use. Reportedly from the state of Maine. 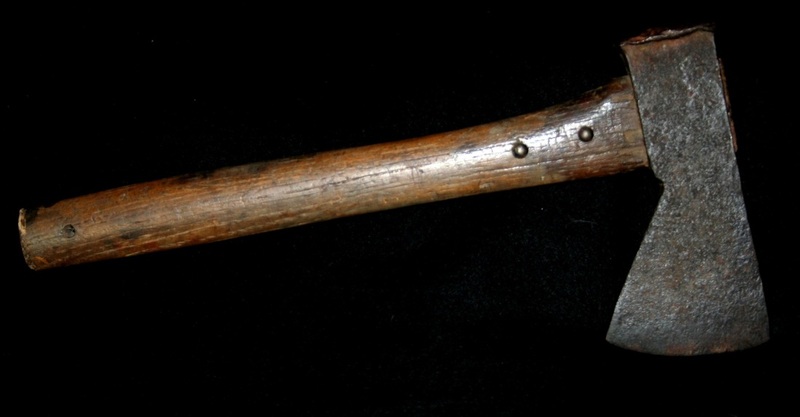 Hudson's Bay Company trade axe, 6.5" x 4", 2 lb. hand forged. 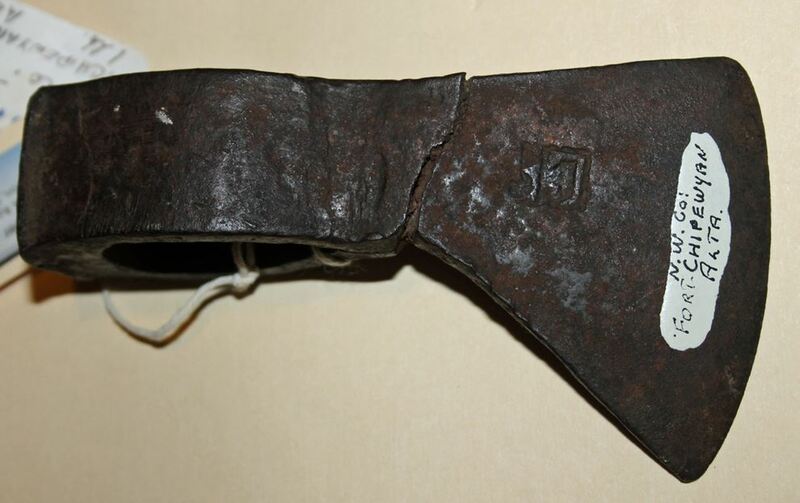 Found in Manitoba 1860's? near site of Fort. 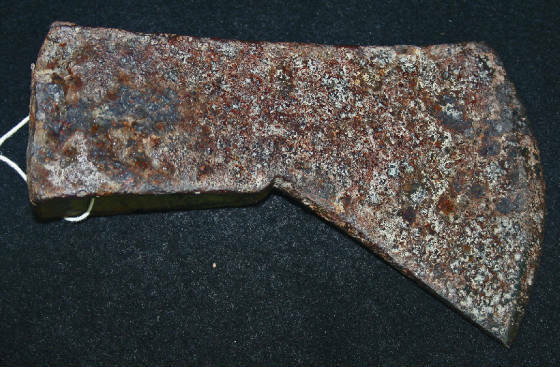 This small Hudson's Bay axe below is very rare in that it is marked by an unknown blacksmith "LE" inside a rectangle. Most are not marked and NONE ARE EVER MARKED HBC OR HUDSON'S BAY CO...except the fakes that is. It was reprotedly found at a Northwestern Fur Company post which of course was absorbed by the Hudson's Bay company in 1821. 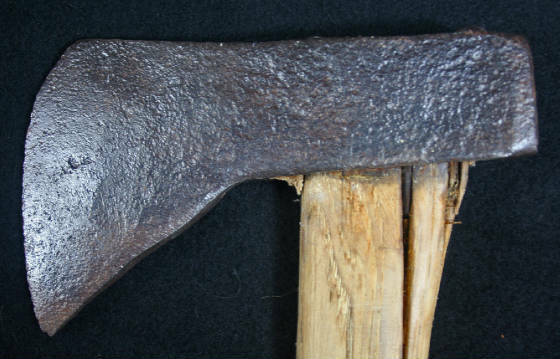 Also noteworthy is the underside notch is absent on some of these Canadian HBC axes. I suspect these may be French Quebec made versions such as where this Northwest Fur Company would likely have been from, but this is conjecture on my part. We have no solid evidence yet if that is the case. This example was reground a bit during the period. 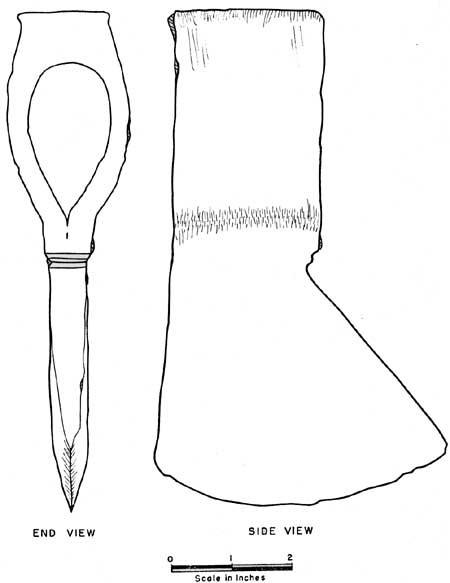 The eyes were a bit dependent on the mandrels or drifts that particular blacksmith had available at the time. Some were apparently more elongate & narrow than others with rounder eyes.